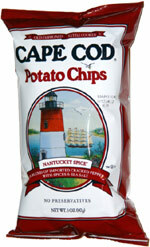 Taste test: These are typical Cape Cod chips (meaning they are the standard which all other kettle chips shall be judged -- in other words, they're good chips) with the added bonus of having a salt and pepper type of taste. We still feel that other salt & pepper chips are better (Utz), these are a very, very close second because they put this on a kettle-style chip. We would have liked to see a bit more salt on this chip, as the pepper tends to dominate the chip. But overall, a wonderful snack from the fine folks at Cape Cod. Smell test: It has an aroma, but we can't place it. Slight spice aroma.